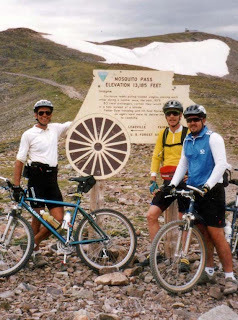 Eight of us will begin our mountain bike ride in Telluride, Colorado on July 23. We will ride on jeep trails through the Alpine Peaks of the San Juan Mountain Range and finish in Moab’s Canyon Country and Desert Slickrock. The route has been set by an adventure ride group called San Juan Hut Systems (SJHS). This is an unguided tour that features a “Hut” to camp in each night. SJHS provides all the food, a place to sleep, and a route map. The route is set up with 6 huts for 7 days of travel over a distance of 215 miles. Although we have food and shelter each night, we are out in a remote mountainous area without cell coverage. We still have to pack food, water, and clothing between huts, for whatever weather conditions we may encounter during the day. The average elevation during the ride is 9,000 feet. We will be bringing spare bike parts, zip ties, and duct tape to keep the bikes rolling. A mechanical failure could be disastrous. There is no vehicle support of any kind. SJUS says they take the “weight” out of bike touring, but if you break down or get hurt, the gravity is on you. Whatever life throws at you, even if it hurts you, just be strong and fight through it. Remember, strong walls shake, but never collapse.